On July 29 in Sevastopol in the annexed Crimea a rally was held against the pension reform of the Russian Federation. The action was organized by representatives of left-wing radical organizations. They were supported by the activist of the left movement from St. Petersburg Yelena Illarionova. She was surprised by a small number of the rally participants (about 20 people), since, according to her, people live much worse in Sevastopol than in neighboring Russia. Local activist Aleksandr Demidov said that the Crimeans "are embarrassed to speak against the Russian government," "because Russia accepted the Crimea after the referendum and saved from Banderas". 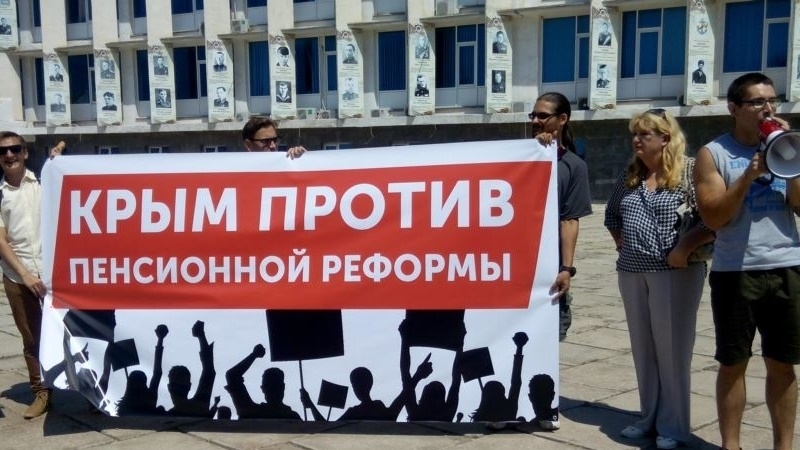 The resolution was not accepted at the rally, activists distributed leaflets against the Russian pension reform. "Capitalism: work for the elderly, unemployment for the young " says the poster. Reportedly, on July 28-29, rallies against pension reform were held in dozens of Russian cities. QHA reported that the Kremlin-controlled parliament of the occupied Crimea supported the Russian bill on pension reform and adopted a corresponding draft resolution on raising the retirement age. The so-called parliamentary speaker Vladimir Konstantinov said that if "the pension system is not balanced", it will be necessary to raise taxes or insurance contributions in the Pension Fund.